Today is Labor Day and this means picnics and cookouts to celebrate the unofficial end of summer. We are making ribs today and I wanted something somewhat compliant so we don't go too far off the rails. While coconut sugar is not part of phase 1 or 3, it is good for maintenance. I use it once in a while on special occasions, since it fits with the plan better than molasses or maple syrup. 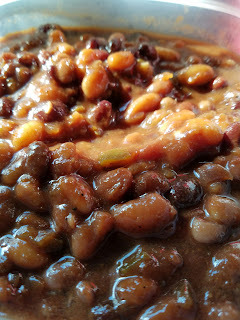 These beans are a delicious healthy addition to your cookout. ** Update- this works well for Metabolism Revolution, with a few adjustments (noted in the ingredients list)-Nice side dish that is PROTEIN! Baked Beans FMD (and MR) style. These are made with dry beans and cooked in a crock pot but you can use canned cooked beans for a faster side dish. Mix everything together in crock pot and cook on low for 10-12 hours or on high for 8 hours. If you want to use canned beans, drain the beans, mix with veggies and spices (omit the water/stock) and bake in baking dish for 45 min to an hour. This is probably a dumb question but, how many cans of beans would you use for this? Lorna, I would not used canned beans for this. Cooking that long in the crock pot would make them mush. You mean Phase 1 and 3, right? These were really good! I made mine in my Instant Pot. They needed 6-7 cups of broth and 60 min cooking time. Thanks for the recipe! Did you pre-cook your beans when you did this in the IP? Thank you!